“[I]t is a question of when, not if, a large-scale attack succeeds.” DTCC and Oliver Wyman, Large-scale Cyber-attacks on the Financial System, March 2018. “The government cannot credibly commit to a no-bailout policy.” Kathryn Judge, “Guarantor of Last Resort,” 97 Texas Law Review, forthcoming. However, the potential for the industry to game an EGA, as well as the very real possibility that politicians will see it as a substitute for rigorous capital and liquidity requirements, make us cautious about its broader applicability. At least initially, this leads us to conclude that the bar for invoking an EGA should be set very high—higher than Judge suggests. That is, we need to find a way to structure an EGA so that it is clear to everyone (both in the financial sector and the official community) that the authority would not be used to address internal threats arising from the behavior of intermediaries themselves. Yet, providing insurance without a commensurate fee in advance creates an incentive for individuals and institution to take on risks that then makes a future crisis more likely. For example, creditors of too-big-to-fail (TBTF) intermediaries are willing to supply relatively cheap funding for risky projects in anticipation of a government bailout. Ultimately, to limit the moral hazard arising from the government’s inevitable crisis mitigation policies, it is essential that risky intermediaries be required to self-insure. No less important is a credible resolution mechanism that makes the failure of all firms―even those believed to be systemic―a viable option in a crisis. What is an EGA? An EGA would be a powerful, discretionary crisis mitigation tool. Judge’s proposal is to give the Treasury Secretary statutory authority to provide emergency guarantees to halt a panic. A set of procedures, reporting requirements and a time limit would constrain this “vast discretion” and perhaps help to contain the resulting moral hazard. The idea is that, by halting a panic, the scheme would provide time for policymakers to assess the underlying threat and to develop a means to address it. The Case for an EGA. Judge’s brief for an EGA is powerful. First, by design, existing crisis mitigation tools have limited purpose. As the lender of last resort (LOLR), the Federal Reserve can support only those banks and (in the case of a specified class of nonbanks) other intermediaries that are solvent. Even when—prior to Dodd-Frank—the Fed still had authority to lend to individual nonbanks, it required adequate collateral. Put differently, the LOLR cannot (and ought not seek to) address the kind of insolvency crisis that emerged in 2008. Similarly, while deposit insurance helps limit runs on banks, it covers only a bit more than one-half of bank deposits, and does nothing to protect potentially vulnerable nonbanks offering bank-like services. Second, as Judge notes, crises (like those that began in 1907 and 2007) often arise from the activity of de facto (shadow) banks. Given the complex U.S. regulatory framework, and the tendency to regulate by legal form rather than economic function, risk-taking that threatens the financial system frequently migrates outside the banking sector and sometimes beyond the regulatory perimeter entirely. Yet, the U.S. regulators of nonbanks have few, if any, credible tools for crisis mitigation. For example, what means would state insurance supervisors have had to halt the 2008 run on AIG, then the largest U.S. insurer with global operations? And what could the SEC do in the future if there were another run on money market mutual funds (MMMFs)? Third, guarantees are an established tool for addressing crises. When deposit insurance works, it prevents runs. During the crisis, the FDIC’s Temporary Liquidity Guarantee Program (TLGP) made it feasible for banks to issue longer-term liabilities while expanding the deposit insurance protection to all transaction accounts. Judge argues that the open-ended commitment by the Fed and the Treasury to support AIG also constituted a form of guarantee. Fourth, speed is essential. Effective crisis mitigation requires a rapid and coordinated response that addresses the underlying causes of the disruption. Legislatures that rely on deliberation are poorly suited to take the lead in crisis response (much as George Washington didn’t want the Continental Congress managing the battlefield). Furthermore, in the fragmented U.S. regulatory environment, no single regulator has the responsibility or authority to act to secure the financial system as a whole, let alone to act across the various classes of intermediaries that populate that system. Even where regulators operate with clear authority, analyzing and identifying the system’s underlying vulnerabilities, and then formulating and implementing the appropriate response take time. The less time available, the more likely that the policy response will miss the mark. So, it makes sense to put someone in charge, and give that person or persons the resources they will need to be effective. Fifth, crisis therapy almost certainly involves picking winners and losers. Which organizations can be safely put through resolution and recapitalized? Should some creditors be made whole, while others are forced to take losses? Should some borrowers be forgiven, and others required to repay? Which financial market utilities must be instantly restored to functionality? As Paul Tucker argues in his recent book, only elected officials have the democratic legitimacy to make such quasi-fiscal decisions. Apolitical technocrats, like central bankers, do not. As a member of the Executive Branch of government, the Treasury Secretary is the natural candidate in the U.S. context for implementing an emergency guarantee. Sixth, to limit the moral hazard of the guaranty authority, Judge proposes a classic approach: let the Secretary promulgate guidelines stipulating that the first systemic intermediary bordering on insolvency will be allowed to fail, before using an EGA to save all the others. In the case of the 2007-09 crisis, this would have meant letting Bear Stearns fail in March 2008—without Federal Reserve support for a JPMorgan buyout—rather than waiting for Lehman to fail six months later. Since there was no regime other than bankruptcy for resolving systemic nonbanks in place at the time, this approach may simply have accelerated the timing of the crisis. Absent a credible resolution regime, it also would have done little to discipline too-big-to-fail (TBTF) firms or their creditors. Today, however, the single-point-of-entry strategy is the FDIC’s carefully designed mechanism that uses its Dodd-Frank Title II orderly liquidation authority for resolving systemic intermediaries. Judge suggests that an EGA would halt dangerous spillovers from the failure of a systemic intermediary, thereby giving regulators the confidence to try out the FDIC’s as-yet-untested resolution approach. To the extent that moral hazard remains a concern, there are salient examples where an EGA ought not exacerbate incentive problems: cyber-attacks that threaten the financial system probably top the list. Mee and Schuermann argue that the next financial crisis is more likely to result from a cyber-attack on payments systems than from banks themselves. 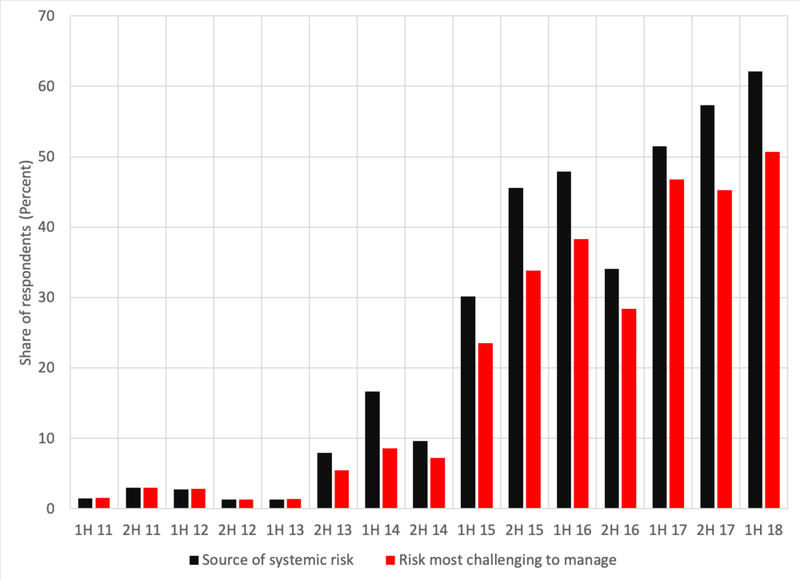 At the firm level, financial executives typically rank cyber-risk as the first or second leading threats to their enterprises and the most difficult to manage (see chart). One recent estimate puts firm spending for cyber protection at nearly $1 trillion globally by 2022. While addressing these threats requires greater coordinated action from financial intermediaries, as well as government leadership, an EGA is unlikely to diminish incentives to act since many cyber-events target specific institutions, at least initially, rather than the system as a whole. Source: Bank of England Systemic Risk Survey. Similarly, there are some organizations that, lacking substitutes, cannot be allowed to halt operations even temporarily. If, following the failure of one or more large clearing members, a key clearinghouse were unable to restore a matched book, its sudden dysfunctionality could be an enormous shock to the global financial system (including to other clearinghouses). In such a case, virtually instant recovery, rather than resolution, is the only reasonable policy option (see Tuckman). An EGA is a logical tool for halting panic and allowing authorities the time to find alternatives and to apportion the losses in such a case. Since FMUs already are subject to close regulatory scrutiny, an EGA should not diminish their incentives to enhance cyber-security. The Pitfalls of an EGA. Not surprisingly, we see moral hazard as the key issue with an EGA. In Judge’s design, invoking EGA requires the Treasury Secretary to “determine that the situation poses a threat to the stability of the U.S financial system and that other conditions regarding the expected benefits of government intervention and the lack of readily available private alternatives are satisfied.” After that, for a period of up to two years and subject to reporting requirements, the Secretary would enjoy enormous discretion to sustain insolvent intermediaries. At its most basic level, government lending to insolvent intermediaries has some very unattractive consequences. First, it subordinates a class of long-term creditors by allowing short-term creditors to exit and inserting the government at the head of the remaining queue when failure inevitably hits. Second, it merely postpones resolution, prolonging the uncertainty. As we have argued, poorly capitalized intermediaries generally do not make loans to healthy borrowers, so this is not a mechanism to sustain an efficient flow of credit to the real economy. While Judge’s two-year EGA limit would help contain these unwelcome effects, depending on the details, it is not difficult to imagine ways that the time framework could be extended. For example, intermediaries could re-design a guaranteed financial instrument with largely identical economic functions under another name. (Or, the institution could reconstitute itself in a form that would potentially qualify for a new guarantee.) And, even if the Treasury Secretary’s hands were bound by the existing statute, Congress could always re-write the law. The ongoing conservatorships of Fannie and Freddie—more than 10 years after their failure—serve as a reminder of how difficult it is to unwind government insurance once it is put in place in an emergency. Second, despite a “first behemoth fails” promise, TBTF intermediaries could still game the Treasury Secretary. History suggests that, when it comes to prudential safeguards, TBTF firms tend to act in a herd-like manner. For example, as of late 2007, the leverage ratios of the largest banks and investment firms centered around 3 percent, ranging narrowly from a bit more than 2 percent to less than 4 percent (see right panel of page 15 here), while more than 25 percent of funding was short-term for all the investment banks, as well as for some of the commercial banks. If, in the future, all the key players were so similarly vulnerable to a large shock, the pressure on a future Treasury Secretary to renege on the “first fails” commitment, or to invoke an EGA thereafter even in the absence of immediate spillovers, would be enormous. Third, and perhaps most important, the existence of an EGA could serve as a crutch that diminishes the incentives for legislators and regulators to promote resilience in good times. Capital and liquidity requirements, reinforced by credible stress tests, are currently the key tools for limiting vulnerability of the financial system. These are inevitably costly, driving down the profitability of financial intermediation both directly through the use of internal resources and indirectly by constraining various activities. It is no accident that the average return on equity of the largest, most systemic intermediaries has dwindled to single digits since the crisis. And, it is unsurprising that systemic intermediaries forcefully oppose requirements that, while making the system more resilient and lowering the social costs of large financial disturbances, raise their private costs of doing business. Especially since the election of 2016, the arguments of these institutions have gained broad support among elected officials in both the Congress and the Executive Branch. For example, in the guise of supporting community banks, Congress in May enacted “regulatory relief” for the largest banks as well, easing both capital and liquidity requirements and reducing the number of institutions subject to stricter Fed scrutiny (see here). And, since mid-2017, Treasury has published a series of reports with similar aims (see, for example, here, here, and here). Now, a well-tested, credible resolution regime would go a long way to address our TBTF concerns. If creditors anticipate bail-ins rather than bail-outs, they will demand a risk-commensurate return on the liabilities of systemic intermediaries. That would reduce EGA-driven incentives to take too much risk. Similarly, a serious focus on regulating financial activities—rather than entities—would diminish the motivation to shift risk-taking beyond the regulatory perimeter. However, it remains especially difficult in the United States, with its balkanized regulatory structure, to ensure that risks are addressed in a rigorous and equivalent manner, regardless of where they might occur. Finally, a secondary concern is that, for an EGA to be credible and effective in halting a panic, the Treasury Secretary must appear to be able to do “whatever it takes.” That means always having an instant call on substantial resources that can be used in a crisis (precisely what Congress took away from Treasury in 2008 when it narrowed the use of the Exchange Stabilization Fund). In theory, Congress could authorize Treasury to access a sufficient volume of funds by issuing debt and depositing the funds at the Fed for future use. Eventually, however, the credibility of the Treasury Secretary’s actions will depend on investor belief that Congress will increase the Treasury’s EGA funding as needed. In this sense, the Treasury Secretary would remain dependent on a supportive Congress. To be clear, we view this as a feature (rather than a flaw) of an EGA, and one that confers democratic legitimacy. The Bottom Line. Our concerns about moral hazard arising from Judge’s EGA proposal can mostly be addressed by setting a higher bar for implementation. At least initially, we would circumscribe the Secretary’s authority to invoke an EGA to those circumstances—such as large and hostile cyber-attacks or outright war—where the calamity is clearly external to the financial system and the existence of an EGA is unlikely to induce behavior by intermediaries that undermines resilience. Such a narrow EGA would help secure the critical functions of the payments, clearing and settlement systems that form the backbone of the financial system. However, at least until the resolution mechanism for systemic intermediaries has been tested, and until the U.S. federal government exhibits much greater willingness to ensure that the most systemic intermediaries are safe, we would exclude disturbances that originate inside the financial system as grounds for invoking an EGA. Acknowledgement: We thank our friend, Kathryn Judge, for very helpful conversations and comments.